Now that hospitals' uncompensated-care claims affect how much the federal government pays them, the industry is bracing for heightened scrutiny of its reporting. This is the first fiscal year of a three-year phase-in during which the CMS will use hospitals' charity care and bad debt, together known as uncompensated care, to calculate their disproportionate-share hospital payments. Those payments used to be based mostly on how many Medicaid, dual-eligible and disabled patients hospitals served, but the Affordable Care Act included the switch under the assumption that more people would gain coverage under Medicaid and subsidized plans. “It was really looked at as a threat before, for lack of a better term, but now it's being implemented,” said Brian Green, a director with accounting firm RSM and co-leader of its regulatory practice, on the impending audits. The CMS pledged to scrutinize hospitals that show a high ratio of uncompensated care to total operating costs, but emphasized in its final 2019 acute-care hospital inpatient prospective payment system rule last week that its audit protocols are confidential. The agency did reveal it expects to begin audits this fall. That means hospitals will have to walk a thin line between not leaving claims on the table and potentially being accused of claiming too much if they're audited, said Christopher Kenny, a partner with King & Spalding who specializes in healthcare. Tim Wolters, director of reimbursement at Citizens Memorial Hospital in Bolivar, Mo., said he thinks the new method is a fairer way to determine uncompensated-care payments. It prevents hospitals in states like his that did not expand Medicaid from receiving lower uncompensated-care payments, which happened under the old formula. Even in New York, a state whose expanded Medicaid program now covers more than 6 million people, executives with the country's largest public health system say they also support the change. That's because NYC Health & Hospitals serves roughly 400,000 uninsured patients a year, most of whom weren't counted under the old formula. “That measure we think more accurately reflects our proportion of care provided to uninsured patients rather than using the Medicaid and (Supplemental Security Income) days as a proxy,” said Linda DeHart, the system's assistant vice president for reimbursement. The American Hospital Association says it's worried that hospitals won't report their uncompensated care accurately because of a lack of clear instructions. The trade group asked the CMS to delay the use of the S-10 worksheet, the section of the Medicare cost report where hospitals report uncompensated care, in calculating DSH payments until fiscal 2019, rather than the current fiscal year. The CMS declined, but it agreed to use the three-year phase-in approach the AHA recommended. Erika Rogan, the AHA's senior associate director of policy, wrote in an email that hospitals need more education on how to accurately complete the S-10s. 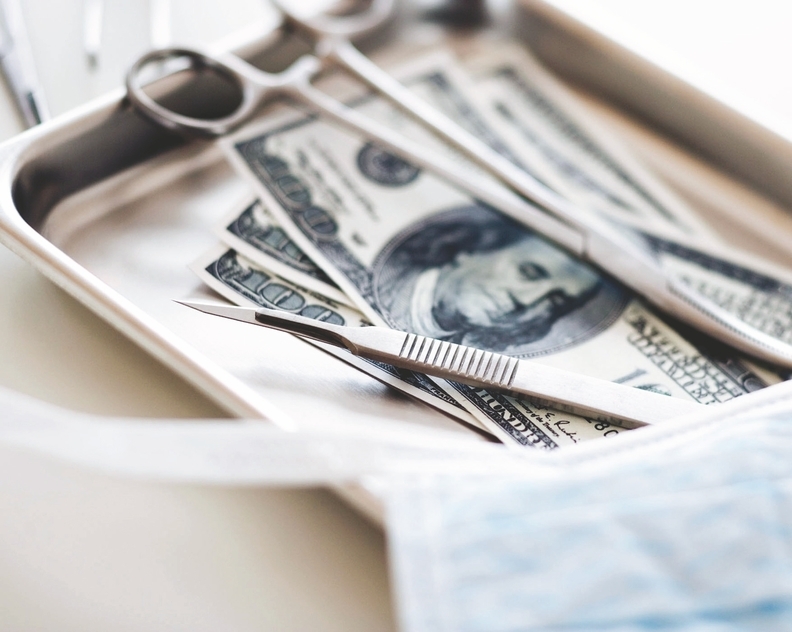 The AHA also asked the CMS to implement a stop-loss policy to protect hospitals set to lose more than 10% of their DSH payments in a given year as a result of transitioning to the S-10. The AHA estimates nearly 18% of hospitals will fit that bill in fiscal 2019. In its final rule, the agency declined to implement such a policy. A CMS spokesman did not return a request for comment. The S-10 is relatively new to hospitals, and there's some evidence that the amounts reported on the form aren't always accurate. A 2017 CMS-commissioned study by Dobson DaVanzo & Associates compared uncompensated-care data reported on S-10 forms with numbers reported on Internal Revenue Service Form 990s between 2011 and 2013. The study found that although the data were highly correlated, there were big differences in what hospitals reported between the measures. For more than half of the hospitals, for example, the difference between the uncompensated care reported on the two forms was around 40%. Commenters on the CMS' proposed rule noted that hospitals reported uncompensated-care costs that ranged from 0.14% to 250% of total revenue. NYCH&H's DeHart said while she agrees there's room for improvement, the CMS has discussed using the S-10 worksheet for quite some time. “Whatever flaws there may be related to the reporting instructions or the fact that they haven't been audited, our understanding is that it's still a better proxy for measuring what the intent of this funding is, which is to support hospitals providing uninsured care,” she said. One thing's for sure: Hospitals must strictly adhere to their own financial assistance policies, which is the key factor that auditors will examine, Kenny said. Policies often require documentation of the patient's financial or asset verification whenever charity care is provided. That doesn't always happen in practice, however, especially when it's abundantly clear to a staff member—perhaps a patient accounts employee—that a patient is indigent and eligible for discounted or free care. Beginning Oct. 1, hospitals will be required to submit patient-level data along with their uncompensated-care numbers under the CMS' final inpatient rule. The rule requires hospitals to send records for each patient encounter that contributed to the uncompensated care amount reported on their S-10 worksheets. Currently, hospitals submit the total numbers, but not the patient-level data. Chad Krcil, a senior manager in Crowe's Medicare reimbursement and compliance unit, said he doesn't think this will be overly burdensome for hospitals, as they are supposed to have that supplemental information ready in case of an audit. Not everyone agrees. RSM's Green said he believes those requirements will place a significant burden on hospitals, many of which simply add up the charity care write-offs listed in their ledgers to report charity care levels, rather than combing through patient data. That's what happens at Citizens Memorial Hospital. Wolters said he knows the patient-level records are out there, he just doesn't collect them for every cost report. To comply with the new requirement, he'll likely develop a separate reporting system to collect charity-care records. Wolters said the process could get “pretty cumbersome” for hospitals if the CMS asks for information that's not routinely collected in their write-off reports. The CMS hasn't released a standard financial assistance policy template for hospitals to follow, and industry experts said the agency isn't likely to do so, as each facility has different degrees of charitable giving and patient populations. Uncompensated-care data that hospitals submitted from fiscal 2014 and 2015 originally showed dramatic swings, so the CMS issued clearer instructions and last year allowed hospitals to resubmit data for those years. More than half of hospitals resubmitted their data, which was due in January, Green said. The CMS did not say whether it will let hospitals resubmit their uncompensated-care data for determining payments in fiscal 2020 and beyond. Uncompensated-care DSH payments historically have been calculated under a formula that uses Medicaid patient days, which was a boon to hospitals in states that expanded Medicaid. The new methodology will gradually shift the benefit to hospitals in states that did not expand Medicaid, as they're likely treating higher proportions of patients who would qualify for charity care or bad debt, and thus would see higher levels of uncompensated care. “Is your state participating in the ACA? If they are, then it might be harmful to you from an uncompensated-care payment perspective,” Jonathan Skaggs, senior manager with healthcare consulting and accounting firm PYA, said of the new DSH payment methodology.